At Barradas and Partners, we feel that it's important to create something special with each project, no matter how large or small. We share our enthusiam with our clients and collaboratively develop design ideas through drawings, models, and animations. We feel that architects should also communicate their unique knowledge of building construction, structural, mechanical and cultural systems. Barradas and Partners is passionate about giving you the best design to fit your needs. John Barradas is an Architect based in Ithaca, N.Y. He is a graduate of Cornell University, College of Architecture Art and Planning and U. Mass, College of Visual and Performing Arts. His dual background in architecture and art is a source of inspiration for his work. John's ability to visualize and sketch designs quickly allows the client and architect to make informed decisions early in the design process. More than 20 years in the architectural profession has afforded John the opportunity to be involved with many major projects in the Ithaca Community including the Science Building at Ithaca College and the Drop-In Children's Center in downtown Ithaca. His familiarity with local construction costs allows him to make design decisions within the clients specified budget. John is also a member of the Ithaca Rotary Club, where he serves on the Jury for the Pride of Ownership awards. These awards recognize property owners who take special care in maintaining and improving their properties. For the award winners, John also prepares a sketch of the building, which is framed and presented with the award. 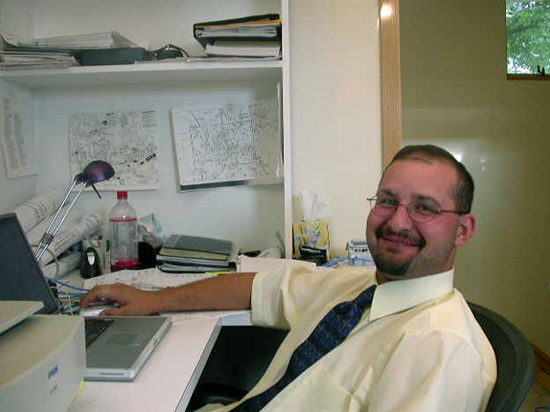 John Barradas is teaching a second year studio at Syracuse University School of Architecture during the fall of 2005. John has also been a guest critic for studios at Cornell University. Brad graduated with a Masters of Architecture from the School of Architecture and Planning at SUNY Buffalo in 2002. Prior to that Brad completed a Bachelors of Environmental Science also at Buffalo. Brad has extensive construction experience and is currently working toward his Architect's License. Joy creates our web page and collaborates on design, working with 3D computer models to communicate design ideas to our clients. She is also working on a Masters of Environmental Design at the Yale School of Architecture and holds a Bachelors of Architecture 2002 from Cornell Univeristy.